Oregon Quarterly features Alec Cowan (BA '18) for archival work on Japanese-American students' experiences in UO English during the 1940s. 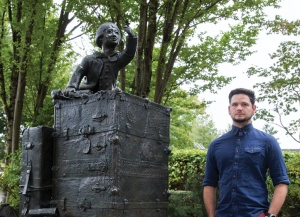 UO English Alum Alec Cowan was recently featured in Oregon Quarterly for his work on Japanese-American students' experiences of studying English during the age of internment. Cowan’s project, “English as Weapon, English as Sanctuary,” documents and interprets student accounts of anti-Asian discrimination at UO. In particular, Cowan follows the life of Michi Yasui Ando, a second-generation American student from Hood River who made substantial contributions to the English program and to the university community. By reading her stories alongside important documents in Oregon political history, Cowan explores what it meant to know and learn English in the age of Japanese American internment, calling attention to language as both an exclusionary tool and a vital means for securing the safety of Japanese-American students. Cowan’s project thoughtfully extends the efforts of English faculty John Gage and Corbett Upton to chronicle the history of the Department through examination of UO’s Special Collections and University Archives.